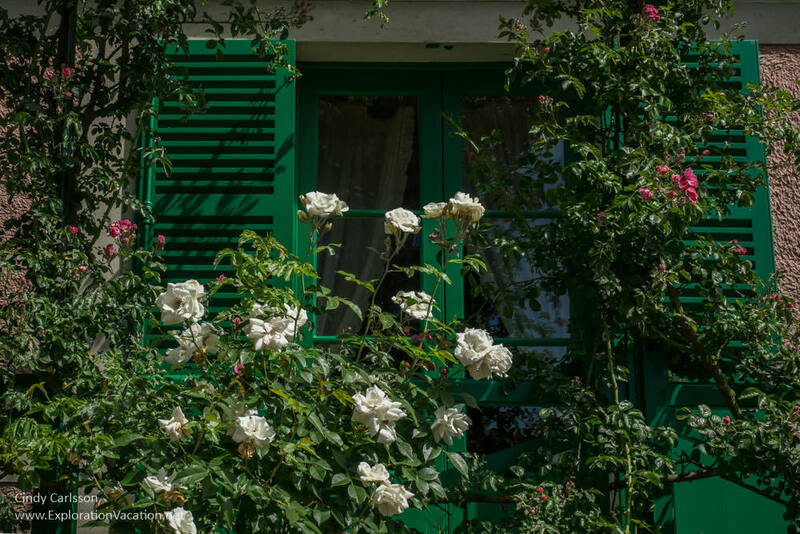 Claude Monet’s gardens and home in Giverny, France, offer a peek into the famous Impressionist painter’s world. Painter Claude Monet moved to the village of Giverny in the French countryside in 1883. He lived and worked there for the next 43 years, transforming an apple orchard and stream into the exuberant landscapes that became the central themes of his painting for the last decades of his life. Visiting Monet’s gardens and home today is an opportunity to step into the world captured in his paintings. Monet is most famous for his large paintings of his water garden, but he loved and painted both gardens. 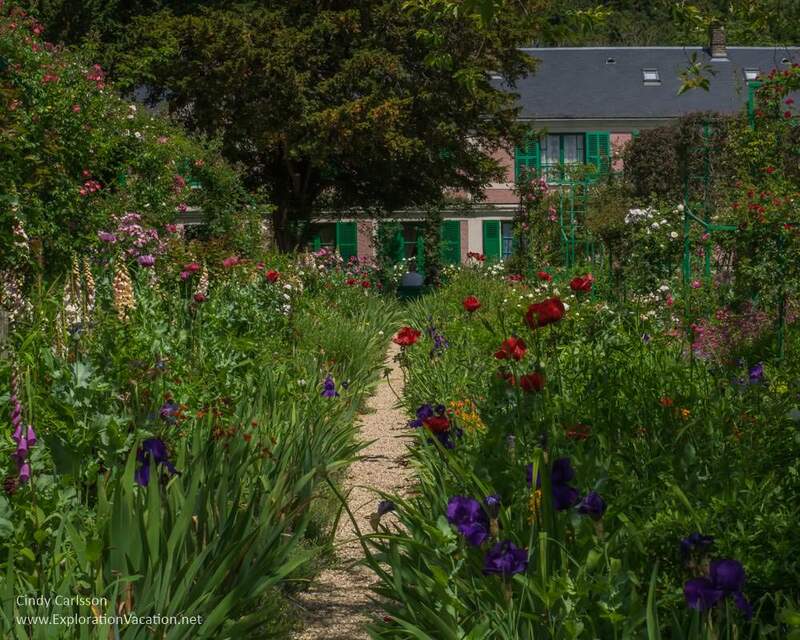 When Claude Monet first moved to Giverny, the house had an enclosed apple orchard and kitchen garden in back. This type of walled yard is known as a Clos Normand or Norman enclosure. It’s a practical design that keeps rabbits and deer from the vegetables and fruit trees. However, one of Monet’s first projects was to lower the walls and remove a double row of cypress and spruce trees. This created a far more expansive space. He then began his lifelong work of creating the garden itself. Metal arches for climbing roses replaced the spruce trees. Cherry and apricot trees replaced the apples. The ground was dug up and planted with thousands of flowers, some planted in big blocks of color like the colors on a painter’s palette, others arranged to form pleasing mounds of intermixed color and shape throughout the year. Ten years after arriving in Giverny, Monet purchased a piece of property adjoining his garden across the railroad tracks. Almost immediately he diverted a small stream on the property to create a pond, which he then filled with water lilies. That first pond was small, with a Japanese-style bridge and just a few waterlilies. Over time, the pond was enlarged and reshaped. Additional water lilies were added and the surrounding landscape planted to create shady groves of bamboo, willow, and rhododendron. 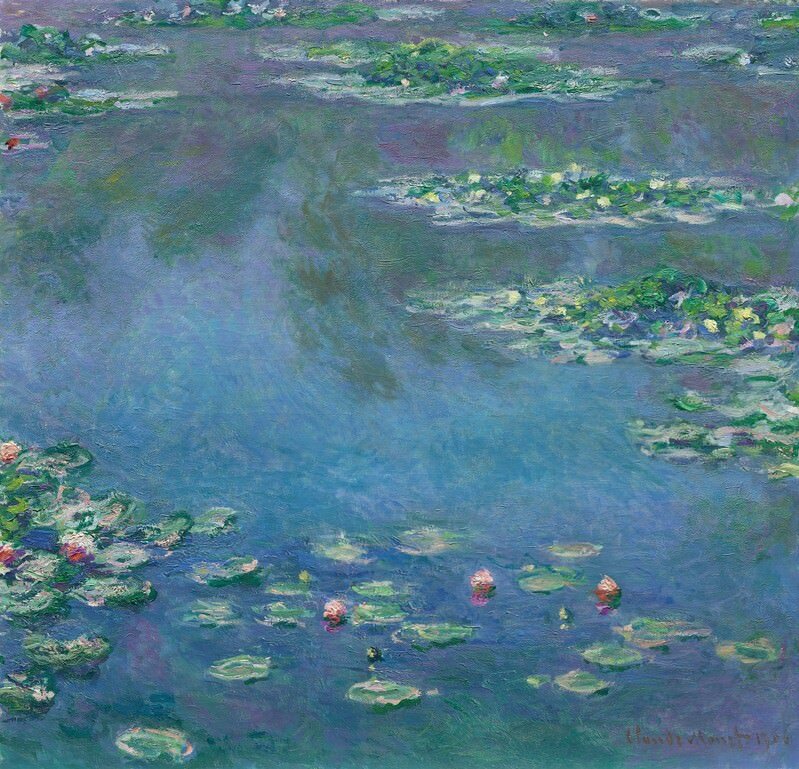 The water garden became Monet’s favorite place both to paint and entertain guests. His paintings of the water lilies, wisteria-covered bridge, and the shimmering reflections they created are among his most famous works. Water Lilies, Claude Monet, oil on canvas, 1906. Photo from the Art Institute of Chicago. Despite its size, Claude Monet’s home is nearly hidden from view behind vines and the lush plantings of the Clos Normand. From the outside, the house is a long, narrow confection of pink walls, white lace curtains, and bright green doors, shutters, and vines. It is equally bright and colorful inside. But the house hasn’t always been so large or so colorful. When Monet moved here in 1883, the farmhouse was large, but much smaller than what we see today. Monet had a large family and many visitors; like the gardens, he expanded his house over time to meet his needs. When touring the house, the first of Monet’s three studios is one of the first – and most crowded – rooms visitors see. This end of the house was once a barn. Soon after moving to Giverny, Monet put a wood floor in the barn, added a stairway, and connected it to the house as his studio. He also turned the second floor into the bedroom that he used for the rest of his life. By 1900 Monet was working in a new studio on the northern side of the building (still later he would build a third studio with a glass roof). It was then that this room became what we see today: a combination reception room, office, and salon where he could relax with family, entertain visitors, and meet with art dealers and collectors. The tour continues up a narrow stairway. At the top, visitors find Monet’s bedroom, complete with (reproductions of) paintings by his friends and beautiful views over the garden. The tour continues on through interconnected dressing rooms to Monet’s wife’s room, which can be quite warm on a summer day! After passing a small sewing room, there is one last apartment. In the last years of Monet’s life, his widowed step-daughter/daughter-in-law Blanche Hoschedé-Monet moved back into the house to assist him and manage the property. These are her quarters, which were restored to look as they would have when she lived here in the 1940s. Back downstairs, the tour winds through the cheerful yellow dining room. The final room on the tour is the large kitchen. Its walls are almost completely covered in beautiful blue Rouen tile and gleaming copper pots hang in a neatly ordered row. While that’s the last room on the tour, it was only the main section of the house. Between them, Monet and Alice (his second wife) had eight children. So, obviously, there were additional bedrooms for the children. Although only an hour from Paris, there may well have been rooms for the family’s frequent guests as well. And, as an upper-middleclass household, the family would have had household help of some sort, at least a few of whom likely lived on the property. 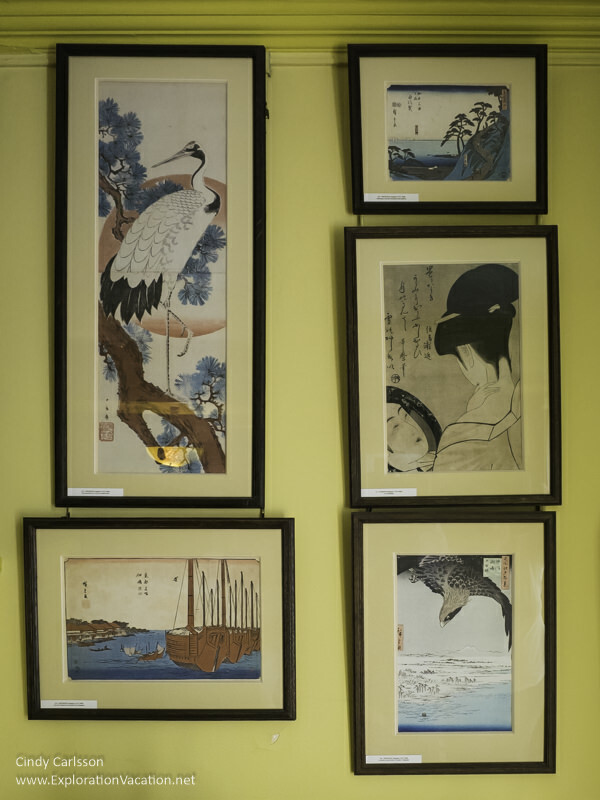 Perhaps surprisingly, much of the artwork on display in the house consists of Japanese woodblock prints. And not just any Japanese prints, but prints by some of the greatest masters of Ukiyo-e prints featuring the “floating world” of Japan’s wealthy elites. Much of Europe was fascinated by Japan during Monet’s lifetime and Japanese-style furniture and art were very popular. Ukiyo-e prints were particularly popular with Impressionist painters who felt a connection to the style and were also influenced by it. While Monet had one of the larger collections, Vincent Van Gogh, Edgar Degas, Camille Pissarro, and other artists also collected these prints. Over his lifetime, Claude Monet collection grew to 231 prints. Their influence on him shows in both his art and in the construction of his water garden. Monet never traveled to Japan himself, but he had Japanese friends who shared his artistic and gardening interests and supplied him with prints and plants. Monet actually had three different studios on the property. The first studio is open to the public as part of the house tour. It appears as it would have early in the 20th century when it served as a salon and reception area in Monet’s home. The second studio was built to the west of the house around 1900. Today this large building with huge north-facing windows is used by the Claude Monet Foundation as office and reception space. To walk through the house and gardens at Giverny today is to feel as if Monet has just stepped out for a moment and could return at any time. 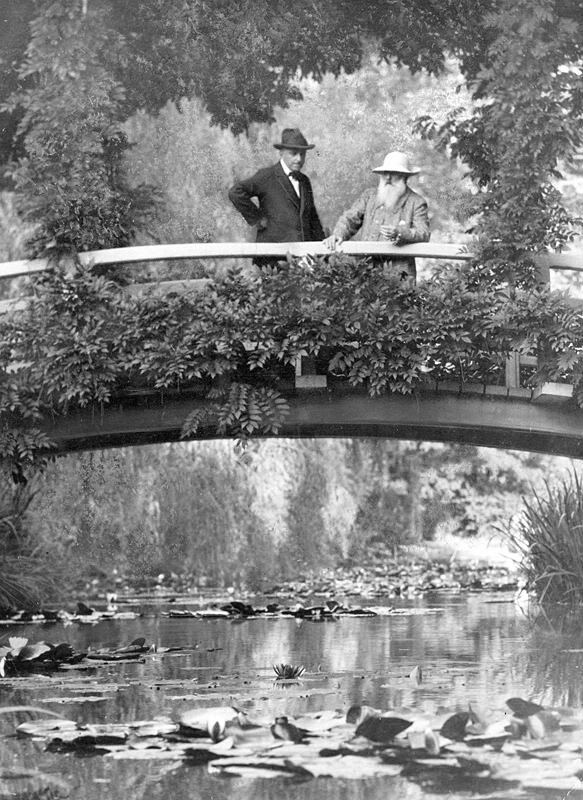 An image of Claude Monet in his garden in Giverny with an unidentified visitor. From The New York Times photo archive, dated only 1922, author not given (the image presumably in a Times December 24, 1922 profile on the painter). Photo via Wikimedia Commons. However, almost everything at Giverny today has been painstakingly restored or completely re-created. After Monet’s death in 1926, the property passed to his only surviving son, Michel. However, Michel had no interest in the property or the gardens (he was far more interested in African safaris and fast cars) and left all of it in the care of his step-sister/sister-in-law Blanche Hoschedé-Monet. Blanche was herself a painter. She was also Claude Monet’s only student, his step-daughter, the widow of his eldest son, and the woman who managed his household for the last a dozen years of his life. After Monet’s passing, Blanche remained at Giverny for another 20 years until her own death in 1947. Through all that time, she managed the gardens with only the help of Monet’s head gardener, Louis Lebret, and an assistant. However, with Blanche gone, the property – house, gardens, and everything in the house – sat abandoned until Michel’s death in 1966. His will left the (now dilapidated) property to the Academy of Fine Arts. After being vacant for 20 years, it seems impossible that anything of value was left when the Academy acquired the property. But, along with the crumbling structures and overgrown gardens, the Academy acquired a great deal of Claude Monet’s personal property, including his favorite paintings and the collection of Japanese prints left hanging on the walls. The Academy didn’t have the financial resources to restore the structures and gardens. However, the paintings, Japanese prints, and other valuable items were removed for protection. (This is how Monet’s favorite paintings ended up at the Marmottan, whose leader was also the director of the Academy.) The Academy also repaired the roof of the house to reduce further damage. However, lacking funds to do more, everything else was left while yet another decade passed. Gérald Van der Kemp took on the restoration of Giverny in 1977, having just finished a successful restoration of Versailles. By then, it had been 30 years since Blanche’s death. The house, studios, and greenhouses had long been without windows and open to the elements. The woodwork in the house was rotten, a staircase had collapsed, and trees grew through the studio floor. The gardens were in worse shape. The Clos Normand was completely overgrown with giant sunflowers, brambles, and weeds. All of the metal trellises had rusted and most of the trees were dead. Across the road, the water garden had become a shapeless, marshy pool inhabited by muskrats that dug up and ate Monet’s carefully selected plants. Only wisteria and the sodden remains of the collapsed Japanese bridge were left. The Academy of Fine Arts put together money for the project, but it wasn’t nearly enough to complete all that needed to be done. To fill the gap, Van der Kemp and his American wife turned to wealthy American art patrons and fans of Monet for help. The funds they gave made it possible to conduct a thorough restoration. Just three years later, in 1980 Monet’s gardens and home opened to the public. 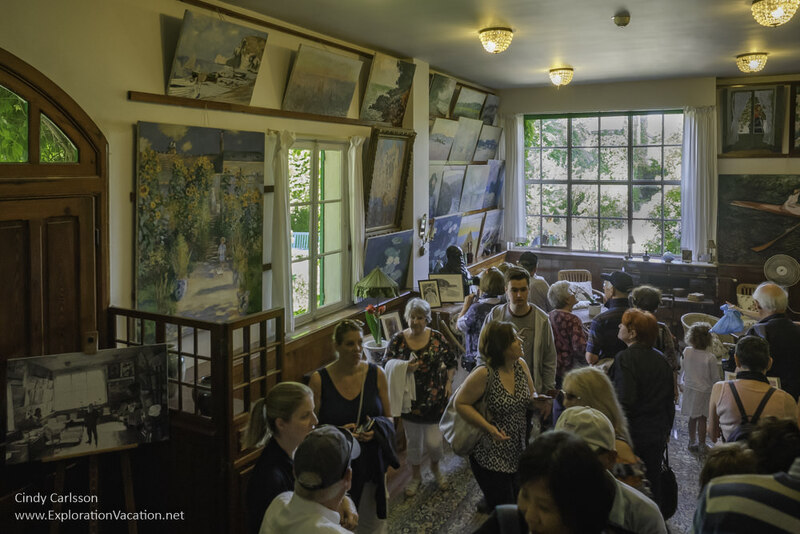 At the same time, the Academy created the Claude Monet Foundation to maintain, operate, and fund ongoing activities at Giverny. During his lifetime, Monet paid seven full-time gardeners to maintain his plantings. By 1977, after decades of neglect, the gardens had been all but erased by weeds, weather, wildlife, and erosion. The gardens were re-created using paintings, drawings, documents, photographs, and letters left by Monet and his family, as well as the memories of those who remembered the gardens from their prime. Every effort was made to use the same plants Monet used. His own records often indicated exactly what cultivars and seeds he purchased. If a specific one was no longer available, it was replaced with a similar one in the re-created garden. The goal was to re-create the gardens using exactly the same plants Monet had used. Finding the right plants was a challenge, but knowing exactly where to plant them was more difficult. Monet’s drawings showed the irregular shape of the water garden and provided a bit of guidance for planting. And Monet had painted the water garden many, many times from a variety of angles. The paintings provided additional guidance. However, the rectangular pattern of the Clos Normand gave few indications of what mix of plants had grown in each bed. Photographs, paintings, drawings, and memories provided guidance, but often for only a small part of the garden. It’s probably impossible to re-create the gardens exactly as Monet had them, but the team did its best to fit Monet’s plants back together. Over the years additional changes have been made in the Clos Normand to better re-create the gardens of Monet’s paintings. Work on the house also began in 1977. Like the gardens, photographs, documents, paintings and personal memory were used to recreate each room as it was when Monet lived in the house. Unlike the gardens, restorers had many pieces of original furniture, personal items, and art to work with . . . most if not all of which also required restoration. While much of the restoration work inside the house was completed for the 1980 public opening, work continued for many years. Monet’s first studio wasn’t fully restored until 2011. Because the room was used for entertaining, there were many pictures to guide the restoration. For example, the replica paintings on the wall represent the paintings that actually hung in the room. In addition, much of the room’s furnishings still existed. About 80 percent of the furnishings in the room today are original, although many were themselves restored before going on display. 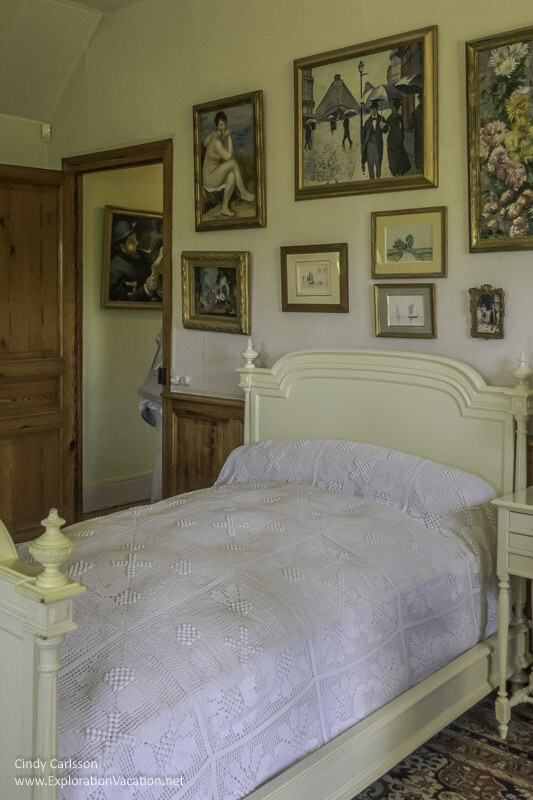 Likewise, a more thorough restoration of Monet’s bedroom was completed in 2013. This room also has most of its original furnishings and reproductions of paintings by a variety of Monet’s friends. The last room to be restored and opened to the public was Blanche Hoschedé-Monet’s bedroom. 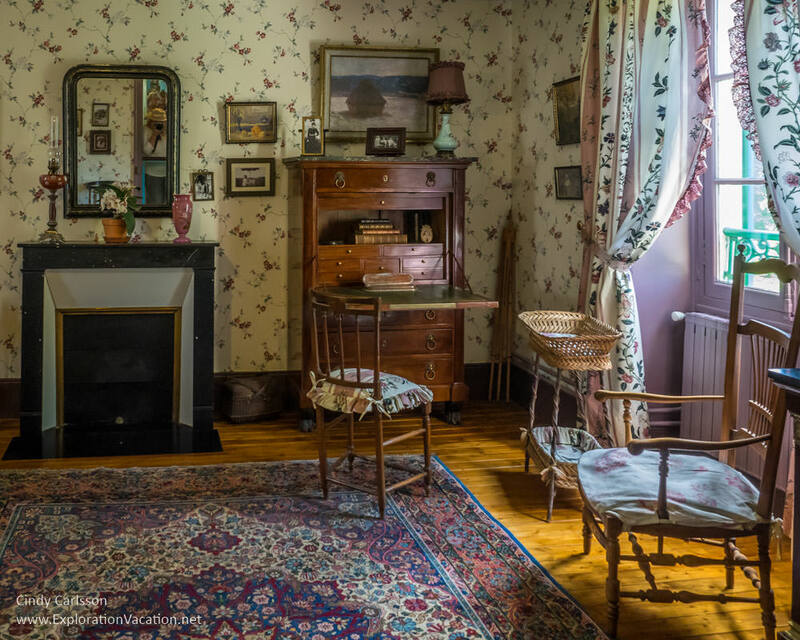 Unlike the other rooms in the house, which are restored to around 1900, Blanche’s room was restored to the period when she lived there at the end of Monet’s life and after. The restoration was completed in 2014. Monet’s last two studies have been converted to other uses (as offices and the gift shop). Although Blanche’s role in preserving the property is often overlooked, she seems to play a critical role in this story. Monet’s son Michel had no interest in the property and, given his later actions, it seems unlikely he would have done anything himself to preserve it after his father’s death. At best he might have sold everything off, dispersing personal items and paving the way for significant changes to the structures and gardens. At worst he would have simply left it all to rot, as he did following Blanche’s death 20 years later. Instead, he allowed Blanche (his step-sister and widowed wife of his elder brother) to continue living in and maintaining the property. She did so through a worldwide depression and a war that landed almost on her doorstep. (At least some property damage was attributed to bombing in the area.) While it’s unclear how well she maintained all of it, the 20 years she stayed on the property delayed its deterioration that much longer. It also kept and Monet family’s personal items together until they passed into the hands of the Fine Arts Academy. Monet’s home, gardens, and supporting facilities are owned by the French Academy of Fine Arts (Académie des Beaux-Arts) and operated by its Claude Monet Foundation. The site includes Monet’s home and gardens, a gift shop, and restaurant. There is also an art museum (featuring artists other than Monet) that is owned by a different entity, but operated in conjunction with the Monet property. The charming village of Giverny, France, is about 75 miles northwest of Paris. It’s a few miles from the city of Vernon and is surrounded by beautiful countryside. It takes a little over an hour to drive to Giverny from Paris, depending on the route and starting point. While a car isn’t really necessary for a day trip to Giverny, it is needed to explore the surrounding area. Rental cars are not available near the Vernon-Giverny train station, but can be rented elsewhere in Vernon and at some other train stations along the route. The train between Paris and Rouen stops near Giverny. While it is quite easy to travel to Giverny on your own, there are many Giverny tours available from Paris. Tours will be for either a full or half day and may or may not include other attractions. Costs and quality appear to vary wildly. Monet’s gardens in Giverny are a seasonal attraction! The site – including the ticket booth – is open from 9:30 a.m. to 6:00 p.m. daily from late March through late October. Check the Monet Foundation website for exact dates. The entire site closes for the winter. Monet’s home and garden is always busy, although the largest crowds will be in spring and summer. The shortest ticket line is generally first thing in the morning (before 10 a.m.) and then later in the afternoon. However, it’s best to skip the ticket line entirely by buying your ticket online in advance. Guidebooks suggest that mid-day (over lunch) or later in the afternoon are the least-crowded times to visit. We were the first in line at the ticket booth at 9 a.m. and entered as soon as everything opened at 9:30. It was busy, but the Clos Normand wasn’t terribly busy. (The house and water garden were packed, as that seems to be where the tour groups start.) By noon most people seemed to have disappeared for the day, although there were still more people in the water garden than I would have liked! A ticket to the site allows you to visit at your own pace and stay as long as you want. We spent about four hours and made a second visit to the water garden over lunch when the tour groups were gone. In Monet’s time the entire garden would have been accessible to visitors. When the gardens were restored, some paths were made wider to allow public access to the garden. Only those paths are open to visitors today. Pets are not allowed anywhere on the property. This is a real garden and gardens change throughout the year. Tulips give way to peonies that give way to lilies and then mums. If there is a particular type of flower you want to see, you need to time your visit accordingly and hope the weather has been normal. (The Monet Foundation website provides a general list of what is in bloom when as a PDF among other information on the plants.) But really, there will always be something in bloom because the gardeners are always removing spent plants and adding new ones. Gardens are always a lot of work, but a garden where annuals are regularly swapped out requires even more work . . . and workers to do it. There are likely always a few people working in the garden. That’s just part of keeping the garden looking good. Keep in mind that the water garden is reached via a tunnel under the roadway. The tunnel is located at the back corner of the Clos Normand, near an entrance for tour groups. There are signs to direct you there. By the time he was finished expanding his house, Monet had a home that was a little more than 16 feet across and 130 feet long. That means it is mostly one-room deep, making it very congested for tourists! Although it appears you can go one of two directions when you enter, DO NOT go up the stairs. Instead, turn and walk through the pantry to Monet’s studio/salon. (This is the biggest room in the house, but also the most crowded.) From the salon, go back through the pantry. Now go up the stairs. Once upstairs, there is only one route to take. Eventually you’ll come back down a second stairway. Although still an agricultural area, Giverny today is largely a tourist town with cute shops, loads of art galleries, and lots of small, up-scale accommodations. It’s an absolutely charming place to wander and makes a good base for a couple of pleasant days exploring the town and the surrounding area. Lodging in the city is often booked-up far in advance during peak bloom times. Plan as far ahead as possible for the best selection and price. While there is not a lot of moderate-priced lodging, there is some. We stayed near Monet’s family church at the family-run Le Coin Des Artistes. It was a short walk from the gardens and had easy on-street parking if you didn’t arrive in the middle of the day. It wasn’t fancy, but our room was clean and sunny with a nice view of the street. There are a number of cafes that serve lunch, but truly wonderful restaurants, particularly for dinner, are in short supply. We ate dinner both nights at the Hotel Baudy’s restaurant, which was near our hotel and had a large outdoor terrace. Be aware that most lunch-only cafes and restaurants stop serving by 1:30 or so. That probably explains why no one is in the gardens at that time of day! Eat a good breakfast, have a granola bar for lunch, then have a lovely early dinner. My guidebooks were all pretty dismissive of Vernon, but when we drove through town, it looked like there were a number of interesting, photogenic spots to stop. We wished we had left some time to explore the town. Consider giving yourself a bit of time there as well. Giverny is a popular tourist site and lots of resources are available. The Claude Monet Foundation operates the home, gardens, and museums. Their website has lots of information on for planning a trip to Giverny, although the English translations can be a bit odd. (The press kit PDF provides some of the best, most readable information on the house and gardens.) Advance tickets can also be purchased through their website. Giverny Village has a wealth of tourist information for the area, particularly for those interested in art and culture. The up-to-date news page is a great resource for tracking exhibits and events at the local galleries. 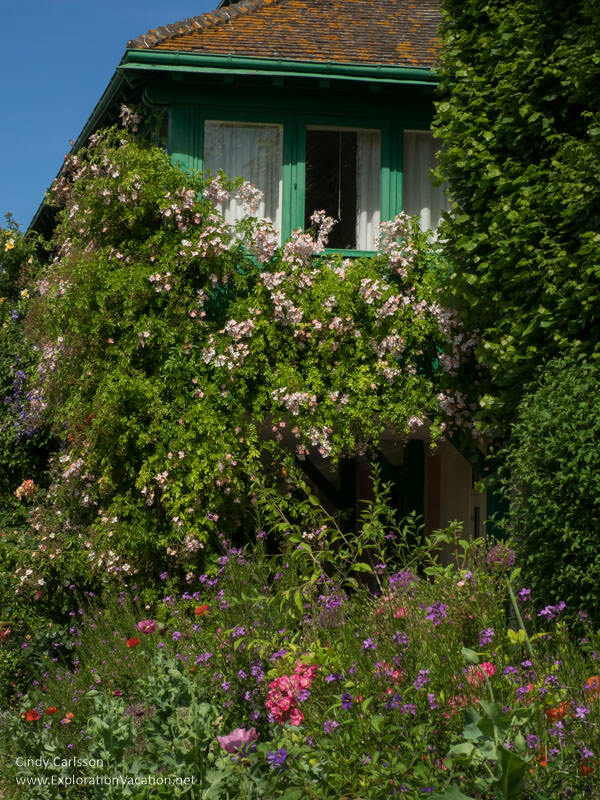 org is a nonprofit web site written by locals (many of who seem to be or have been guides at Giverny) with a wealth of easy-to-digest information on Monet’s house and gardens, the village, and the surrounding area. Unfortunately not all sections are entirely up-to-date. Giverny guide Ariane’s website Giverny Impression has posts that show changes in the garden throughout the year. Images of Monet’s gardens during his lifetime and later (in French) can be found in the gallery of Jean-Michel Peers on com. The Art Institute of Chicago has an interpretive resource that examines Monet’s water landscapes. A very readable web page on Claude Monet’s Japanese print collection puts the collection and the influence of Japanese art on the Impressionists in perspective. However, there is no indication of the author’s authority – this could be a school project. 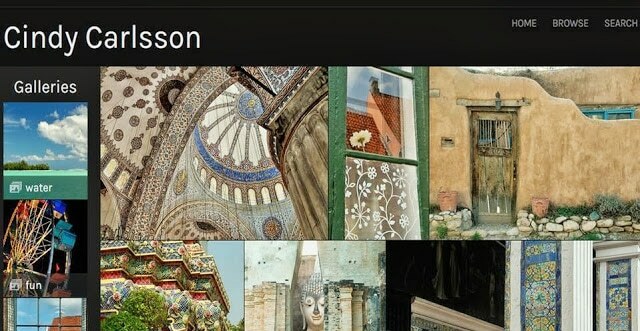 This post is linked to Travel Photo Thursday on the Budget Travelers Sandbox. Very timely for us, Cindy, since we are planning a trip to Paris and northern France in early October. Tom just told me last night that he could “take or leave Giverny.” I’m betting your post will change his mind! Very lovely post! Thank you. Oooh, a trip to France. That should be great. (It would be a great place to spend time on the water, as well as in gardens  We should get together — I’d love to hear your plans. What a beautiful place! The gardens are stunning and of course the iconic water lilies are impressive. 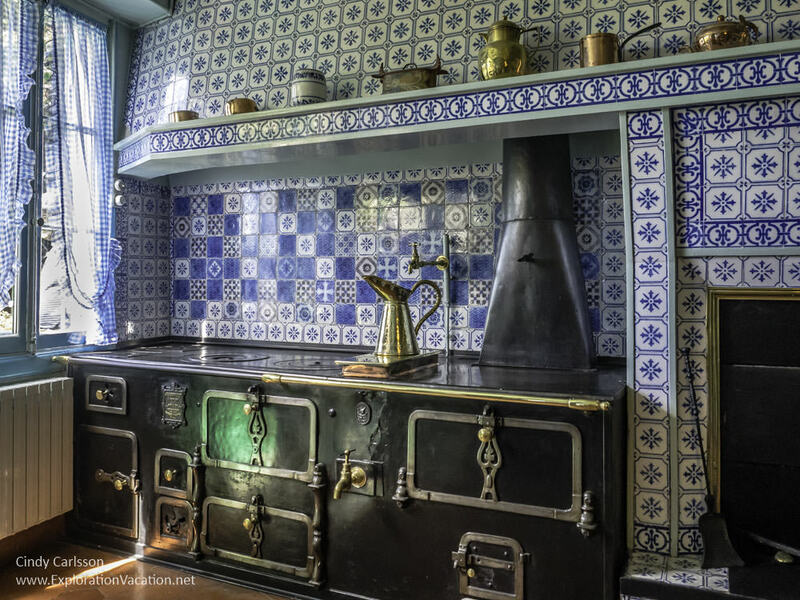 I love the blue and white tile in the kitchen too! We were hoping to make it there when we were in Paris a few years ago, but didn’t have the time. I’ll have to put this on my list for next time! I hope you enjoyed your virtual visit, Ruth. And I hope you get there in person sometime too! Thanks for helping keep TPThursday going! For those who really can’t tear themselves away from Paris, the Bagatelle is another great garden option. The gardens are larger and more varied than Monet’s, but, of course, they weren’t created by Monet! This post is just full of beauty. So many gorgeous scenes and well captured. I would love to go there one day. Thanks for linking up with Travel Photo Thurday. Thank you. It really is a beautiful place. It’s also fascinating to walk through and see how it relates to Monet’s art. I hope you get there someday. If I had one more day during my trip to Paris, I would have spent it at Monet’s house in Giverny. Now that you’ve shown me what I missed, I yearn to return to France some day and go there. I’d love this house and garden, even if it wasn’t Monet’s. But Monet’s artistry is probably what makes it so remarkable to look at. I wish my garden looked like this, and I really like his yellow dining room chairs and the tiles in the kitchen. It’s taken me a couple of trips to France to get here, but it is totally worth it. I too wish my gardens looked like this and still hope that someday they will look a little like this – once I win the lottery and can hire some gardeners to help me! I can use Monet as my guide. And yes, I’d also like a room full of those blue tiles! I hope you get there to see it all for yourself! Those gardens are spectacular, and you’ve captured them beautifully with your photography! 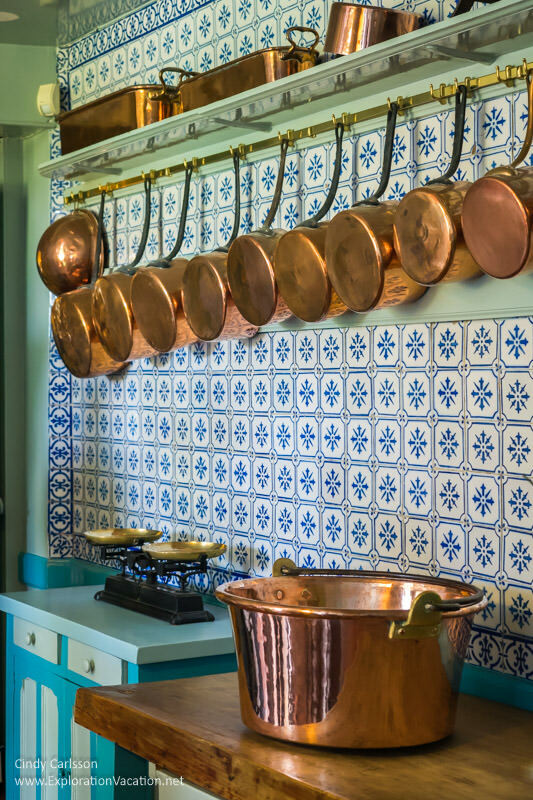 I love his kitchen tiles, and I’d take that copper pot collection too!